You just got your first pair of contact lenses, good for you. Like a lot of people, you will spend at least a few days admiring at these small wonders of science and technology. Getting contacts is pretty cool to be sure, it can also be a little scary as well. Contact lenses are high-tech medical devices that are literally placed upon your eyes. So it is important that you fully understand how to stay comfortable and safe while wearing them. 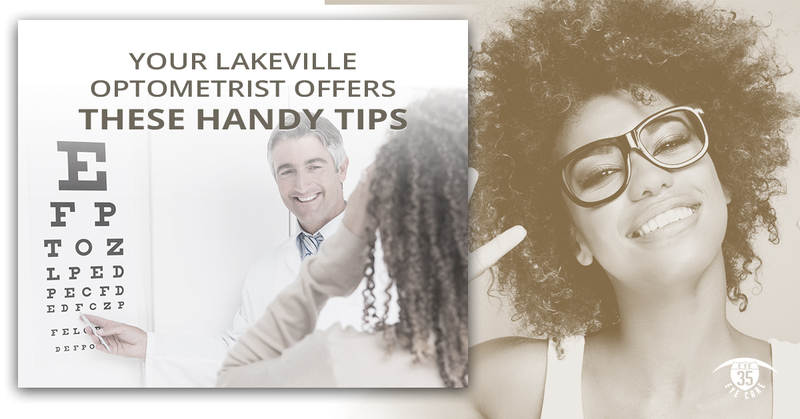 Eye 35 Eye Care, home of your optometrist in Lakeville, offers these tips designed to put you on the path to a lifetime of success with your new contact lenses. Never try to write your own set of rules. You need to wear your contact lenses only for the amount of time that your prescription says and replace them according to that schedule. You might think it’s fine to stretch out the use of your contact lenses by a few days or perhaps weeks. After all, what is the worst that can happen? It’s not worth the risks you take to save a few dollars by stretching out the use of your contact lenses. In addition, it is never a good idea to sleep with your contact lenses still in, unless you have been prescribed continuous wear contact lenses. Use only the products that are suggested by your eye doctor. You shouldn’t use substitute lens care products, even store brand ones, until you have checked with your doctor first. The solution that was suggested to you was done so for a reason. Certain types of lenses need specific types of solutions. So don’t make the assumption that one kind of solution is good for all types of contact lenses. It is also important that you show up for any follow-up appointments recommended by your eye doctor. It’s important that you drink plenty of water to stay properly hydrated. This is important for those who don’t wear contact lenses. You may also want to supplement your water intake with putting drops in your eyes if they are dry. There are certain activities, like staring at a computer screen for long periods of time, that can dry your eyes out. The important thing to remember here is to check with your eye doctor to see which eye drops are best for you. You should never take a shortcut when cleaning your contact lenses. You will be given instructions on how to properly clean your contact lenses by your eye doctor. Pay attention. For example, if your doctor says you need to change out the solution every day, then topping it off is not an option. Don’t freak out about having to wear contact lenses. You might be nervous about putting them in and taking them out at first, but in no time you will get used to it. If you are ready to take that step and get contact lenses, contact Eye 35 Eye Care.